This One Summer details the summer of Rose and Windy, two girls whose families vacation at Awago Beach every year. The two are close friends, and it’s obvious from the start that they have history together. There’s more to their summers at Awago Beach than just carefree vacation time. An undercurrent of quiet sorrow runs through the story as Rose and Windy goof off and live out their summer vacation. The art and the story are a perfect match for either, and both work to convey the certain endless — yet fleeting — feeling of summer that comes with being young. The friendship and back-and-forth between Rose and Windy feels authentic, as does the familial bonds. And, as is obvious by the cover, the art is incredibly gorgeous. I had to keep pausing while I read, just so I could stop and admire the beautiful backgrounds. 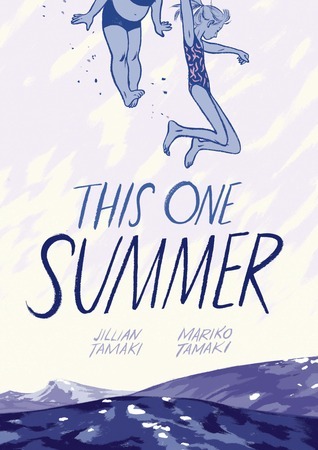 Like Skim, This One Summer is at once poignant and thought-provoking, and fun to read. I can only cross my fingers and hope for more to follow.